Identification: Distinguishing characteristics given by Miller (1983), Hubbs et al. (1991), Menhinick (1991), and Page and Burr (1991); a formerly used name is Mollienesia latipinna (Miller 1983). Miller (1983) gave a key to this species and other Mexican Poecilia. Photographs of wild-caught and aquarium strains appeared in Wischnath (1993) and Yamamoto and Tagawa (2000). Native Range: Atlantic and Gulf Coast drainages from Cape Fear drainage, North Carolina, to Veracruz, Mexico. Restricted to coastal areas in most of range; found farther inland in Florida, Louisiana, and Texas (Page and Burr 1991). Table 1. States with nonindigenous occurrences, the earliest and latest observations in each state, and the tally and names of HUCs with observations†. Names and dates are hyperlinked to their relevant specimen records. The list of references for all nonindigenous occurrences of Poecilia latipinna are found here. Ecology: Generally occurs in shallow, slow-moving surface waters of marshes, ponds, streams, ditches, swamps, and estuaries. Commonly associated with vegetation. Widely tolerant of temperature, salinity, and low oxygen levels. Means of Introduction: In most areas this species probably was introduced by way of aquarium releases. It was first brought to Hawaii from Texas in 1905 to test its effectiveness in controlling mosquitoes (Seale 1905; Van Dine 1907; Brock 1960). A failure in Hawaii at mosquito control, this fish has on occasion been used as a tuna baitfish in that state (Randall 1987). Status: Established or locally established in Arizona (Minckley 1973), California (Swift et al. 1993), Colorado (Zuckerman and Behnke 1986), Montana (Holton 1990), Nevada (Deacon and Williams 1984), and Texas (Hubbs et al. 1991). Although established on most islands of Hawaii at one time (Devick 1991b), recent reports indicated the species may be disappearing in some localities (Yamamoto and Tagawa 2000; Mundy 2005). Impact of Introduction: The Sailfin Molly is responsible for the decline of the desert pupfish Cyprinodon macularius in California (U.S. Fish and Wildlife Service 1983). 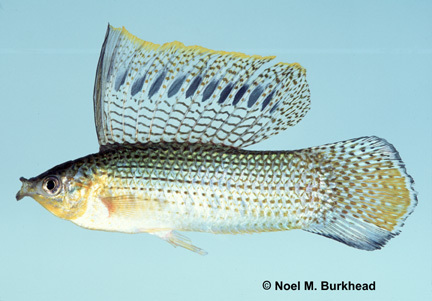 Sigler and Sigler (1987) stated that the Sailfin Molly has probably impacted native species adversely. Sailfin mollies, and other introduced poeciliids, have been implicated in the decline of native damselflies on Oahu, Hawaii. Often the distributions of the damselflies and introduced fishes were found to be mutually exclusive, probably resulting from predation of the fish on the insects (Englund 1999). Remarks: The Sailfin Molly has been stocked for mosquito control, even though it is largely or completely herbivorous (Courtenay and Meffe 1989). Records of this species in a few areas apparently are based on reports of the black molly, a hybrid, and not pure P. latipinna (Courtenay and Meffe 1989). Wischnath (1993) stated that U.S. commercial breeders have released various domestically bred forms, including P. latipinna hybrids, into natural waters. Contrary to Brown (1953) and Hubbs et al. (1991), Lee et al. (1980 et seq.) argued that P. latipinna found in inland waters of Texas were native. Improperly citing Van Dine (1907), Kanayama (1968) incorrectly used the name Mollienesia latipes for the species introduced to Hawaii. Voucher specimens: California (LACM 36402-3), Montana (UMMZ 188981). Brown, W. H. 1953. Introduced fish species in the Guadalupe River Basin. Texas Journal of Science 5:245-251. Deacon, J. E., C. Hubbs, and B. J. Zahuranec. 1964. Some effects of introduced fishes on the native fish fauna of southern Nevada. Copeia 1964(2):384-388. Hubbs, C., and J. E. Deacon. 1964. Additional introductions of tropical fishes into southern Nevada. Southwest Naturalist 9:249-251. Hubbs, C., T. Luciere, G.P. Garrett, R.J. Edwards, S.M. Dean, and E. Marsh. 1978. Survival and abundance of introduced fishes near San Antonio, Texas. The Texas Journal of Science. 30(4): 369-376. Mearns, A. J. 1975. Poeciliopsis gracilis (Hackel), a newly introduced poeciliid fish in California. California Fish and Game 61(4):251-253. Seale, A. 1905. Report of Mr. Alvin Seale of the United States Fish Commission, on the introduction of top-minnows to Hawaii from Galveston, Texas. The Hawaiian Forester and Agriculturist 2:364-367. Shapovalov, L., W. A. Dill, and A. J. Cordone. 1959. A revised check list of the freshwater and anadromous fishes of California. California Fish and Game 45:159-180. St. Amant, J. A. 1966. Addition of Tilapia mossambica Peters to the California fauna. California Fish and Game 52:54-55. U.S. Fish and Wildlife Service. 1983. The Moapa dace recovery plan. Prepared in cooperation with the Nevada Department of Wildlife. 32 pp. Yamamoto, M. N. and A. W. Tagawa. 2000. Hawaii's Native and Exotic Freshwater Animals. Mutual Publishing, Honolulu, HI. 200 pp.